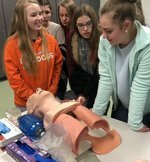 Students traveled to Kingsport for the eighth grade career fair on Thursday, March 7. The day began and ended at the farmers’ market in downtown Kingsport, and students walked to several different buildings on the Northeast State campus to participate in their chosen career interests. They got to experience a variety of hands-on activities and demonstrations from multiple career paths, such as veterinarian, EMT, chef, actor, SWAT team member, machinist, welder, and more.